What subcompact car has 420 horsepower, a 5.0-liter V-8 engine, is rear wheel drive, and sprints from 0-60 MPH in 4.3 seconds (according to Motor Trend)? 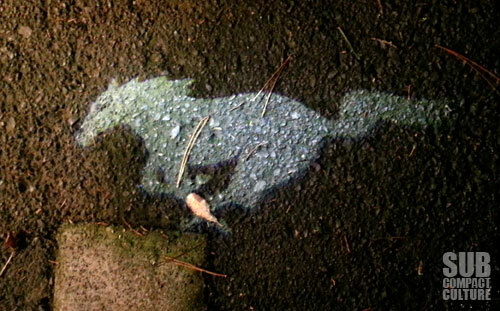 The answer is the 2013 Ford Mustang GT. And yes, the Ford Mustang is technically a subcompact vehicle. See, the EPA, the government agency that assigns vehicle classes to cars, uses interior volume as the variable to classify cars sold on the U.S. market. 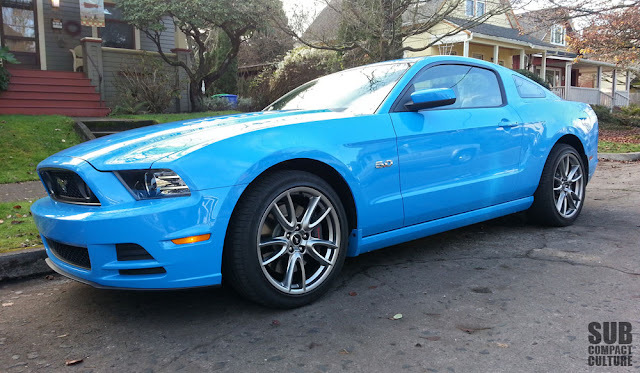 Therefore, with 83 cubic feet of interior space, the Mustang falls into subcompact car territory. And let me tell you: This is one fast, fun beast of a subcompact car. In fact, it’s a hell of a vehicle no matter what you want to classify it as. Although I’ve had a thing for small cars for as long as I can remember, I’ve also been a Mustang GT fan from the time I rode in the back of a 1990 Mustang GT as a kid. As a youngster, I thought the mighty 5.0-liter Ford V-8 was the largest engine on the market, and remember bragging to friends that my dad test drove one and I got to ride in it! Ah, youth. But there’s definitely something about that hairy-chested, throaty, deep V-8 sound that you can’t help but love—even as a 12 year old kid. Now that I’m all grown up (or at least pretend to be), I’ve driven a host of Mustang GTs (as well as the fire-breathing GT500) and I can tell you this: I dare you to drive the 2013 Mustang GT and not have a grin on your face at full throttle. It’s a sensory experience: Torque throwing you back in your seat; a wide-open V-8 bellowing out a symphony of Detroit iron; the wide tires clawing at the earth for traction. This, my friends, is a uniquely American vehicle. This, is a muscle car. Did I mention it was a subcompact? The Ford 5.0-liter V-8 has been a legendary part of the Mustang for years. Ford went to a 4.6-liter V-8 in 1996, but reintroduced the 5.0-liter engine for 2011, this time with 32 valves and dual overhead cams. The result is a wonderfully responsive engine that makes 420 horsepower at 6,500 RPM, 390 ft./lbs. of torque at 4,250 RPM, and redlines at 7,000 RPM. Our test model transferred power to the rear wheels via a quick-shifting six-speed automatic transmission, although a six-speed manual is also available. And while I believe that buying a Mustang GT with an automatic transmission should be a federal offense, the car is still impressively fast, extremely powerful, and a total handful even if you’re not shifting the gears yourself. If you want to shift the automatic in a manual fashion, there is a mini rocker switch on the side of the gearshift that lets you change gears at the push of a button. Paddle shifters would’ve been a nice feature instead, as the button seems a bit wimpy compared to paddles or even moving the shifter left to right to select gears. This vehicle also had the limited-slip differential, grippy Brembo brakes, and 255/40/19 tires. Mash the throttle, and there becomes an epic battle between wheelspin and traction control. Turn the traction control off, and it’s a one-way trip to wheelspin city. Of course, during the week I had the car it rained nearly every day, making traction even that much more of an issue. In fact, you need to pussyfoot around in this car in the rain thanks to the big power and wide tires. I can’t imagine what it’d be like in the snow; not something I'd want to do. If you can hook the 19” tires up to some dry pavement, you’ll be rewarded with blistering acceleration accompanied by a sound that is simply intoxicating. I felt giddy each time I got to mash the throttle. However, a lot of care needs to be taken with this much go-fast (especially in the rain). The Mustang’s rear and likes to step out fairly easily, but it’s controllable partially thanks to traction control and the limited-slip diff. door is open then shut. That's pretty cool. Of the three modern pony cars, Dodge Challenger, Chevrolet Camaro, and of course, the Mustang, the Mustang feels the smallest, the lightest, and most nimble (and yes, I’ve had time behind the wheel of all three). The Ford does feel weighty, but at 3,675 lbs., it isn’t too terribly heavy for what it is. A comparable Dodge Challenger weighs 4,041 lbs. ; the Chevy Camaro 3,741. The car rides very stiffly, as you’d expect out of a high-performance vehicle. You’ll feel the ruts and bumps in the road. However, you’ll be rewarded with very good handling, too. Make no mistake, this isn’t a Miata or a Scion FR-S, but this is a car that will follow the nimble cars through the corners without wincing. The electric steering is nicely weighted and quick (the metal accents on the wheel make for cold hands when it’s chilly, though). There are multiple settings for the steering, too. Simply navigate through a few menus, and you can choose a sport or comfort setting. In addition, there are a host of other options, too, although most don’t affect the performance. The neato trip computer also has an accelerometer that lets you calculate things such as ¼ mile and 0-60 times, braking performance, and such. It’s “for track use only,” of course. 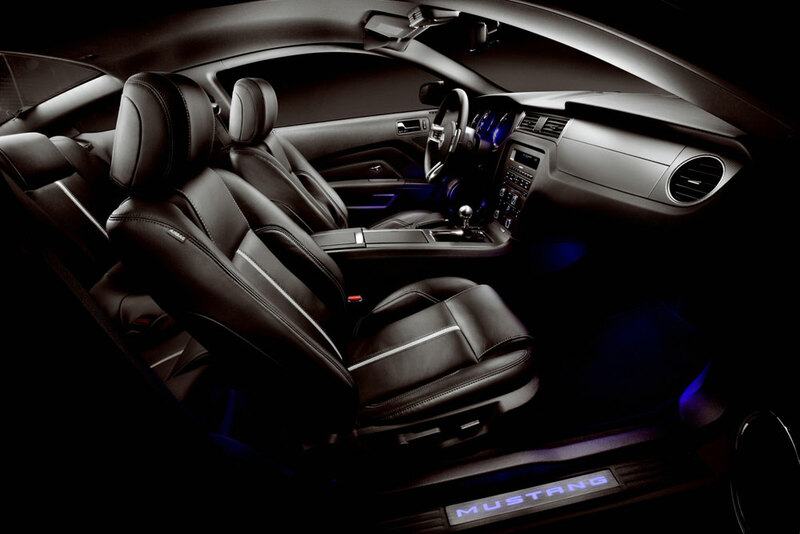 You can also customize parts of the interior to your liking thanks to multiple color choices for the gauges and gauge bezels as well as ambient lighting. It also can display fuel economy. In mostly city driving, I got 15.8 MPG. Guess what? I don’t care. Overall, the interior is respectable and solid. I really liked the metal trim bits, especially on the dash, and the interior feels like it’s made of mostly high-quality materials. And, unlike some of the other modern muscle cars out there, I don’t feel like I sit too low; I can see out easily. The Shaker audio system is also above average. However, there are a few interior shortcomings. The automatic transmission’s shifter placement, for instance: When in park it’s difficult to access the climate/radio controls. Speaking of, to operate the climate control, there’s a combination of touch screen and push-button controls that are not intuitive. I literally couldn't figure out how to select air to come out of the feet vents and not just the defrost setting. Additionally, fellow Subcompact Culture contributor (and my wife),Mercedes, pointed out that the seats were not as supportive or bolstered as you’d expect in a 420 horsepower sports/muscle/pony car, and I agree. However, for an additional $1,595 you can get Recaro seats—an option I’d get for sure. And while we’re talking about seats, the rear seats are pretty useless for adults. My 6’1 friend could barely fit back there, and knocked his noggin against the roof. It’s best for kids or a child seat. By the way, our tester also had navigation, Xenon headlights, Ford's SYNC system, and a bunch of other goodies you’d expect from a sports car. direction. A very cool feature and they look great. But really, people aren't buying Mustangs of any trim level for the interior. They’re buying them for performance and styling. I happen to love the Mustang’s looks. This is a car that looks like it’s ready to punch you in the face at any moment, then steal your lunch money—a good thing. From the inset driving lights to the sequential LED taillights (a favorite attribute of mine), Ford has done a great job with this car. It’s still modern, but has enough retro flare to maintain tradition without looking campy. And that Grabber Blue paint job—you either love it or hate it—and I love it. Ours also came with the sticker delete and spoiler delete for an all-business look. 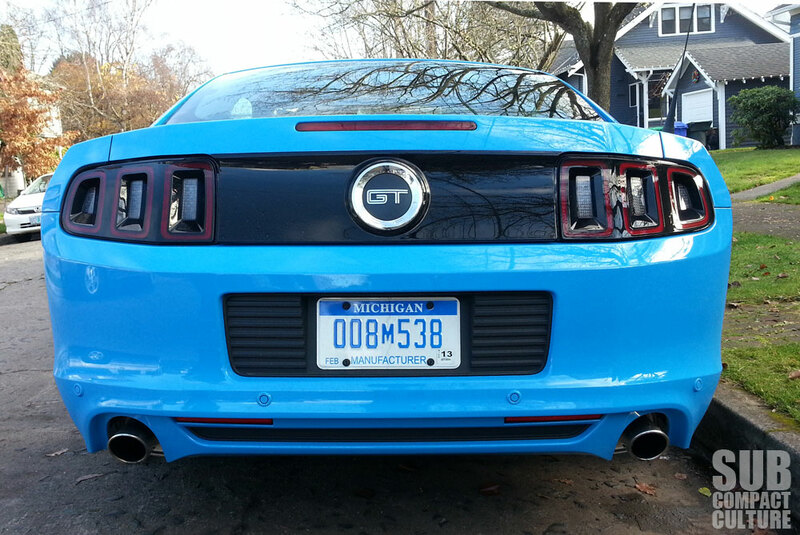 For me, the Mustang GT is it. It’s got the raw power, it’s got the great looks, it’s got the tradition and the heritage. Although I won’t be trading in our Toyota Yaris … and our Subaru Forester … and the Suzuki Sidekick … plus some cash … to get a GT, I aspire to own one someday. For me, all the parts of this car, all the emotion and feeling behind it, come together in one ideal package. (Well, almost ideal. 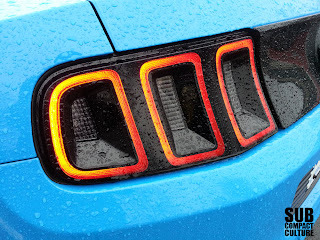 If it got 38 MPG and cost $13,000, it’d be ideal, but I digress …) Our test ’Stang came to about $42,000, although a GT starts at $31,545 including destination. Mark my words, someday I’ll own one, and I’ll proudly display my Subcompact Culture decal on it. After all, this is a subcompact car. Yes, I thoroughly enjoyed the car. And I agree: it is far from what people would consider a compact or subcompact car. However, it illustrates a point about the EPA's classification and how it means little these days. Did you know the Porsche 911 Carrera is listed as a "microcompact"? Maybe it's time for an overhaul to the classification system?